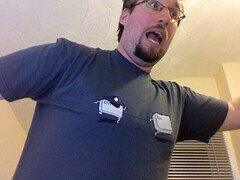 Since it’s GTA IV week, what could be better than a good old geek inspired cops ‘n’ robbers based t-shirt? Not many things, that’s what. The t-shirt itself is pretty simple. A CTRL key dressed like a policeman is chasing after an ESC key. Obviously, the ESC key tried to fight the law, but it looks as though the law is going to win. C’est la vie. Maybe things aren’t as simple as that though. Whilst the CTRL is definitely a cop, the ESC could just be a normal person – he isn’t wearing the stereotypical striped convict’s outfit so beloved of the 1920s. So, maybe the t-shirt is actually an allegory of the control the state has over our lives and that the common man must always run to stay alive. Or, maybe it’s just a cute t-shirt. “Fugitive” is available from uneetee for $17.99 and is printed on a asphalt American Apparel shirt.